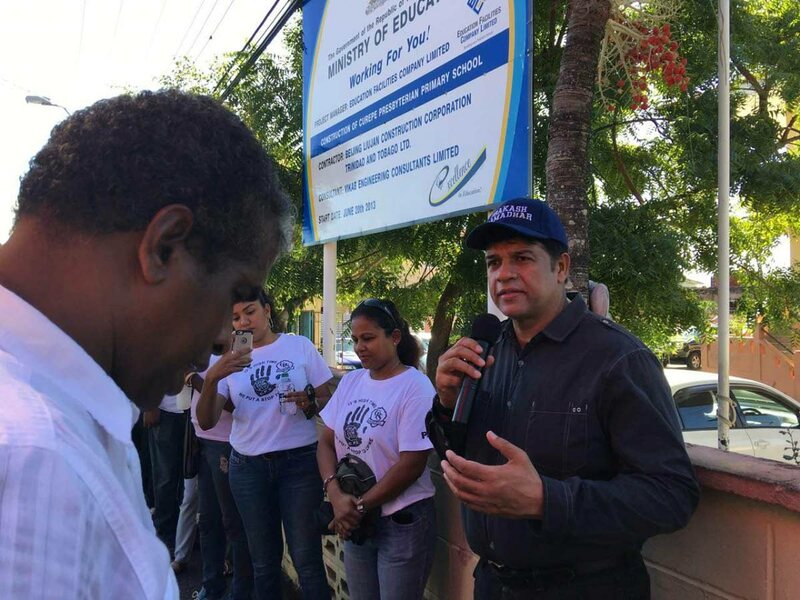 St Augustine MP Prakash Ramadhar (right) speaks during a prayer walk yesterday with the PTA of the Curepe Presbyterian School. Education Minister Anthony Garcia says the completion of the Curepe Presbyterian Primary School is under consideration, but finances are in dire straits and the ministry has to prioritise. Garcia was responding to a prayer walk held yesterday by the PTA of the Curepe Presbyterian Primary School as it continued its calls for a new school to be finished and for the children to be removed from the termite- and rat-infested building. St Augustine MP Prakash Ramadhar was also present. In a release yesterday, Ramadhar said the PTA walked around the school and prayed that the new building would be completed and handed over in 2018. “The PTA is calling on the minister and those in authority at the Ministry of Education to complete the work which was halted in 2016 and to secure the building from further vandalism and theft,” the release said. As a result of the construction of the new building, the 620 students are forced to play within limited space, the classrooms are extremely hot and there is only one washroom stall per gender. In October the Presbyterian Board reported the new school was 60 per cent complete and was one of four Presbyterian schools still to be finished, together with Woodbrook, Piparo and Harmony Hall. Garcia, in a telephone interview, said a number of schools were still to be completed and as minister he would be very happy if all could be completed next year and every school that requires refurbishment and repairs is also completed. He added, however, it is simply not possible because of the dire financial situation, so the ministry has to prioritise based on the urgent need of schools and attend to them. Asked if Curepe Presbyterian was to be prioritised, Garcia said the ministry was still working on the priority listing. Reply to "Education Minister: Finances in dire straits"